As the weather in Salt Lake City turns windy (seriously, did anyone else whisper to themselves “I don’t think we’re in Kansas anymore” this evening? ), resurrection keeps on happening, just like the Lord intended. Worship this morning was particularly lovely, featuring the Rev. Kimberly Jackson from the Absalom Jones Episcopal Center as preacher. The House of Bishops today passed two resolutions about climate change: C045, calling for divestment from fossil fuel investing, and A030, establishing a climate change advisory committee. These resolutions will now move to the House of Deputies for concurrence. 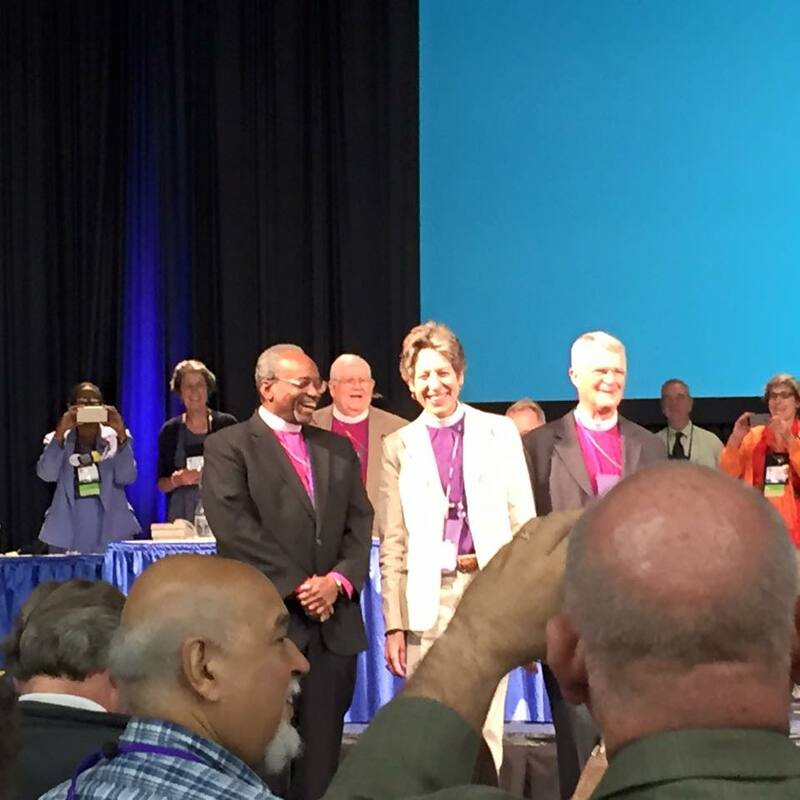 In possibly one of the most photographed moments of General Convention so far, the past, present, and future Presiding Bishops of the Episcopal Church appeared together in the House of Deputies. Bishop Curry, Bishop Jefferts Schori, and Bishop Griswold. Photo credit: Susan Brown Snook. And finally, in another point of personal privilege, The Collect Call’s first live recording is now available on iTunes, Soundcloud, or wherever you listen to podcasts. Featuring Kyle Oliver, Lisa Kimball, Sean Maloney, David Simmons, and a lively studio audience, this has so far been the most fun I’ve had at General Convention hands down.